Religion is often accused of causing most of the wars in history. This is hardly fair. People are quite capable of picking fights without any divine inspiration, even if religion is a handy justification to cover your true motives. And religious leaders sometimes take a role in solving problems, which evens up the balance sheet a bit. But the charge is not totally groundless. Religion itself can be the problem, and the religious trauma of the late Roman Empire is the textbook case. The pattern is one that is familiar from looking at the news today. One group commits an outrage against another in order to provoke a reaction. The reaction is then used to justify the other group’s case and to strengthen the authority of its leadership. All political leaders know how to use a good enemy. The cliches appear. ‘There is a war on.’ ‘If you are not for us you are against us.’ Nowadays we say that people are radicalised. The process takes on a life of its own with the cycle of crimes, martyrdom and repression being retold and reinterpreted. It can take centuries to work itself out to a final conclusion, by which time hardly anyone has any idea of why they were fighting in the first place. Using violence to promote their religion was the major innovation of the early Christians, and one that worked very well for them. As it usually does, it led to a cycle of violence from other groups which probably peaked at about the time Julian became emperor. But it changed Christianity as well. It had originated as a group of friends of a charismatic leader. It had developed into a handy scam run by frauds and hucksters. Now it was changing again into an organised cult of thugs and fanatics. When they acquired power under Constantine they changed again and started attracting the ambitious and the politically ruthless. We’ll be hearing less and less about female pastors and bishops being elected and more about their appointments and their intrigues. Although Christians remained an overall minority in the empire, they were now centre stage and making the running. But there was plenty of opposition, at least potentially. The pagans were suffering from the destruction of their temples. Both pagans and Jews were being harassed by regulations explicitly designed to make their lives difficult. The possibility of full scale civil war was very real. The fighting so far was limited to the struggles amongst the Christians themselves. The Donatists in North Africa were in open rebellion. The orthodox were being persecuted by the Arians. Blood was flowing freely. An empire with enemies on the Rhine, the Danube and the Euphrates had opened up a fourth internal war. The world had gone crazy. Someone had to bring it back to its senses. What were Julian’s options? He could continue the policy of favouring the Arians and trying to impose their creed on everyone else. This was the most straight forward, but it meant continuing to devote military resources to violent repression. The least difficult policy politically would have been to switch support to the orthodox Christians. This would have got him the support of the strongest single faction and I think this can be considered to be the ‘default’ position. This would have been the surest way of achieving stability, though it meant conceding a lot of power to the church hierarchy. The hardest thing to achieve was the most desirable. The long term health of the empire would most benefit by bringing an immediate end to the faction fighting between the groups. Was there any way to do this? The ideal would have been an official separation of church and state keeping politics and religion apart and leaving every citizen to genuinely chose their own belief system, much like the admirably secular constitution of the United States. Advanced as Roman civilisation was, it wasn’t ready for that. But there was an option that wasn’t too far off it. How about a tolerant paganism that recognised and supported diversity of belief? Julian’s initial proclamation was ideal. He gave all subjects of the empire full freedom of religious expression. This sounded promising and could have been the basis for a realistic settlement. The pagans could restore their temples, and the banned Christian heretics could return to their posts. The Christians lost their right to torment each other, which actually made a considerable number of Christians beneficiaries of Julian’s policy. Handled well, it could have marked the beginning of a new era of peace and mutual tolerance. But to do this, in an age of intolerance and fanaticism, Julian would have had to rise above faction fighting. Unfortunately, Julian for all his virtues was not that man. And when you look at what he had come to believe, and how he had come to believe it, it isn’t hard to see why. Although he is best remembered as being the last pagan emperor, he was not a traditional pagan with beliefs inherited from his ancestors. He was called an apostate as an insult by his enemies, but an apostate he was according to the dictionary definition. He was brought up as a Christian but consciously rejected that religion. This is pretty inflammatory behaviour, as Sir Salman Rushdie could confirm. You can of course reject a religion – many people do it every day – but you can’t reject your upbringing. He had been brought up in the typical fanaticism of the time. When he converted to paganism he took the fanaticism he had been trained in over to his new religion. Basically, he was as crazy as the rest of them. Maybe he would have been able to cure himself of this with time. He was a resourceful and intelligent man and seemed to have remarkable self control, and above all he was always willing to learn. But time was the thing he never had. But as it was the empire was now run by a man for whom the religious controversies of his time were not a problem to be managed, they were his chief preoccupation and he had chosen the side he was going to support. People who actually act on their religious impulses are rare. True believers are scarce enough to begin with, and they tend not make a huge impact on the world. Following the actual teachings of most religions would more or less guarantee you a blameless but obscure life. History is generally made by people for whom this world rather than the next is what is on their mind. But there are one or two rare exceptions. St Paul springs to mind. He seems to be both sincere and worldly enough to understand how things work. Actually as an aside for non-Christian listeners – which I imagine is all of you by now – St Paul is well worth a read. He isn’t anything like the impression you get of him from the people who like to quote him a lot. Neither man would welcome the comparison, but Julian shows the same genuine devotion to his beliefs combined with a shrewd practical appreciation of how the world actually works. Julian’s paganism was acquired not inherited but by the time he became the emperor was deep rooted. He had been to obliged to study the Bible as a child. I think it was simply the shortcomings of that book that put him off. This is a common enough experience. Many atheists say that the Bible is the book that they would most recommend to someone they wished to dissuade. I don’t think any further explanation is really necessary. There was probably no particular point at which he rejected Christianity, but we can say precisely when he aligned him clearly with paganism. At the age of 20 he was initiated, in deep secret, into the Eleusinian mysteries. The mysteries were a secret initiation rite into a cult based in Eleusis. The origins are lost in prehistory and by the time of Julian were over a thousand, maybe two thousand years old. The rites were secret. Betraying the secrets was punishable by death so not surprisingly, not much is known about them. But this doesn’t stop Gibbon from speculating. I shall not presume to describe the horrid sounds, and fiery apparitions, which were presented to the senses, or the imagination, of the credulous aspirant, till the visions of comfort and knowledge broke upon him in a blaze of celestial light. Despite the secrecy the mysteries had been quite respectable. The temple had been under the protection of the emperors and the emperor Hadrian had been initiated. Marcus Aurelius had rebuilt it when it was damaged in a barbarian raid. But with the rise of Christianity they had fallen from favour and Julian was taking a huge risk by getting involved. Who knows, maybe the Christian hierarchy did get wind of it. That might explain why they were so keen to get rid of him. One modern theory about the Eluesinian initiation rites is that there may have been psychoactive substances involved. If so, this might explain why Julian was to spend the rest of his life literally talking to the Gods themselves. He knew them well enough to be able to recognise them as individuals, and often sought their advice. This is one of those things makes Julian closer to the Christian emperors that he despised than the traditional pagan predecessors of an earlier age. It is hard to imagine Augustus or Vespasian chatting intimately to Zeus. It sounds much more like Constantine who knew Christ well enough to get direct personal messages. As conservatives throughout history have found, you can never really escape the times you actually live in. I have speculated that it was reading the Bible that put the intellectual Julian off of Christianity. But that doesn’t explain why he turned to paganism. Paganism wasn’t really one religion, it was a patchwork of gods, concepts, practices and superstitions accumulated over many centuries and absorbed from many cultures. It didn’t really have a theology, more a haphazard menu of options you could pick and chose from. At first sight it is hard to imagine how this chaotic jumble would appeal to an intellectually rigorous philosopher. Even if Christianity was philosophically a bit rubbish at this stage in its development, how was this any better? But there was a strand in paganism that fitted the bill perfectly. Julian attached himself to the school of the Platonists. Their version was based on the work of Plato but with a lot of refinements. Paganism, in its Platonic form, makes a lot more sense than Christianity does. If you have a notion of paganism like the one I was taught at school, where the Jews were pioneers of monotheism as some kind of unique innovation which Christianity built on, prepare for a shock. Platonic Paganism was monotheistic. The universe was the creation of a single entity – the One. The One was the prime mover and creator of everything. However he – or more properly it, the One is beyond gender – chose to operate through lesser beings that he endowed with free will, most important amongst which were the Celestial Gods. There were seven of these, corresponding to the seven objects in the sky that can be seen to move against the solid background of the fixed stars, the five planets visible to the naked eye plus the Sun and the Moon. In fact the ancients referred to all seven as planets – the word literally means wanderers. Even today, each of the seven days of the week has its corresponding planet and deity. The Greek philosopher Ptolemy had worked out a very beautiful cosmology based on each of the planets occupying its own sphere that rotated above the Earth. His calculations allowed the movements of the planets to be predicted with great accuracy. This is now looked back on as an early triumph of science, which indeed it is. But it also fascinated the Platonists. Porphyry, one of its leading thinkers, wrote a review of Ptolemy’s work. Down here on Earth everything is change and decay. The next sphere up is the Moon which is unchanging but whose face still looks a bit random. Further up the Sun is a more splendid being but one who still interacts a lot with the Earth, drawing up the water to create the rain etc. Moving up the spheres get slower moving and more ethereal until you end up in the seventh heaven next to the unchanging eternal stars. The movements of the planets, if the sun and moon are included, do have a correlation with events on earth such as the seasons and tides. It isn’t so far fetched a notion then to suppose that a careful study of the skies might predict what was to happen on earth. Now that Ptolemy could tell you what was going to happen in the sky, the way was open to divining the future here on Earth. This idea is still to some extent alive in the horoscopes that daily papers still publish. The fact that the seven heavens all had their own god gave a plausible way to use this information to sway things your way. Maintaining good relations with the gods was clearly key, and so it was crucial to keep the temples up and running and sacrifices regularly made. The system of the Platonists has an appealing elegance to it. The free will accorded to the Gods and their ability to act independently neatly overcomes the many logical problems you get with an omnipotent being. Take the existence of evil for instance – always a tough question for a believer in a debate. How do you square all the bad things that happen with an all powerful loving God? The Platonists could take this in their stride. Sure, the One is perfect, but that doesn’t stop Jupiter from cocking up from time to time. He’s only a powerful immortal god after all – he can’t be expected to know everything. And the different deities have different areas of expertise and agendas, so although they are all working to fulfil the vision of the One, some conflicts and misunderstandings between them is inevitable. It also makes prayers a lot more sensible. Praying is psychologically a very satisfying process, but one that flies in the face of logic if you are either an atheist or a believer in an omnipotent being. In the first case, nobody is listening. In the second, He knows already so why bother? For the pagan it is simply good sense. If you can contact a being that is in a position to help you, why wouldn’t you give it a go? So four hundred years or more after the death of Plato his followers were coming up with new and creative interpretations of his work, and modern ways of looking at religion. In retrospect modern academics have coined the term Neoplatonism to describe it. Gibbon doesn’t use this term and it wouldn’t have had any meaning at the time so I am not going to use it either – I just mention it because if you want to look into it further that is probably the best term to stick into Google to get started. 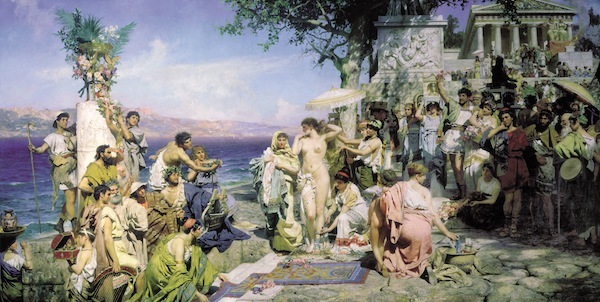 That the thinking going on around paganism was both original enough to justify a name to distinguish itself from traditional Platonism, and even that paganism at this stage had intellectual developments associated with it in the first place are completely at odds with the notion that the pagans were a moribund bunch bereft of ideas that were easy meat for the new Christian religion to replace. The Platonists were in fact the cutting edge of the philosophy of the time and the Ptolemeic system was the most advanced science. In fact it was Christianity that was lacking in coherence. In the third century a lot of the work of trying to make Christianity make some kind of sense was still in the future. When Julian was on the throne, Saint Augustine was still a toddler and very little work had been yet been done on exactly what framework Christianity fitted into. Much later, when Christianity no longer had any rivals to fear a lot of the ideas from the Platonists would end up getting incorporated into the faith, but for now they were enemies. Julian had found himself right at the heart of the Neoplatonist project. The leading figure in the reworking of Platonism was Plotinus who had died about a century before Julian’s reign. He placed the emphasis on the One as the source of everything and was uninterested in anything about this world except in how it would help lead to a truer experience of the One. He was big on the nature of the soul. His view was that the soul played a large part in creating the material of the world in which it lives. The soul was made up of a higher spiritual part and a lower earthly part. The passions and vices of the lower world were to be avoided as distractions, and which could lead to forgetting our true spiritual home in union with the One. This was the philosophical basis of Julian’s enthusiasm for self denial and spartan living. One of the leading pupils of Plotinus was Porhyry who made many contributions including preserving and publicising the work of Plotinus. Porphyry may well have been a Christian early in his life. There is no reference to this in his own writing but it has the ring of truth about it. A later account has it that he had been put off Christianity when he was attacked by a group of Christian thugs. He certainly wrote a treatise against them later. This was destroyed on the orders of Constantine. Both Plotinus and Porphyry used philosophy as a way of interpreting the universe and were not keen on the arts of theurgy. But Porphyry’s pupil Iamblichus took the opposite view and regarded the matter of the world as spiritual in itself. This gave him a more practical frame of mind and allowed him to freely use the framework of Platonism to practice divination and magic. Iamblichus enjoyed a phenomenal reputation in his own day and basically for as long as his magic powers were still believable. He is usually referred to as the divine Iamblichus. Julian had studied under Aedesius, himself a pupil of Iamblichus . The Platonists had been persecuted by Constantine, another sign that paganism was far from moribund, but they were still writing and teaching discretely. Julian had found a group that was secret, intelligent, opposed to Christianity and which must have offered the camaraderie of shared beliefs and shared danger. He must have been in his element. Although pagans were the majority, the committed Platonists were a very small grouping within them albeit an influential one. Julian’s conversion was potentially their big break and word of it spread to the votaries in every province. I don’t see any reason to doubt Julian’s sincerity – he was running a huge risk by associating with them at all let alone signing up – but it did give him an empire wide network of contacts and potential supporters. It was nowhere near as efficient as one of the Churches would have been, but it was something. So the adoption of Platonic paganism gave Julian a coherent set of beliefs that guided his actions and shaped his lifestyle. It also gave him a programme and a goal for his reign. And it gave him a cadre of supporters to draw on in governing the empire. He could also call on the support of the gods, which would have been handy had they existed. Its hard to know to what extent his beliefs clouded his judgement, but it is a tragedy that such an able man should let phantoms influence him. I get the impression that Julian also felt it gave him the support of the majority of his subjects. In this he was deluding himself. His experience in Gaul where there was no opposition to his paganism might have misled him. He seems to have been surprised by the level of support for Christianity in the eastern half of the empire and by how solid that support was. He was also to be disappointed at the low levels of motivation of the pagan in the street. The pagans were appalled by the destruction of their temples and worried that policies likely to offend the heavens would be dangerous. But except in the east they didn’t show any particular animosity towards the Christians. But we’ll get onto all that in the next episode. Like nearly all the images I use on this blog, I got it from Wikipedea.